The South American continent is home to the world's highest waterfall, Angel Falls in Venezuela, the largest river (by volume), the Amazon River, the driest place on Earth, the Atacama Desert, the largest rainforest, the Amazon Rainforest, the highest commercially navigable lake in the world, Lake Titicaca, and the longest mountain range, the Andes. This mountain range is a mix of a high number of mountains and volcanoes. There are numerous active volcanoes all around the globe, broken by scientists into 12 general regions. Most are famously found on the Pacific “Ring of Fire“, where there are 452 volcanoes - 75% of the world’s active and dormant domes (90% of the world’s earthquakes also occur on the Ring of Fire). The Ring of Fire is a direct result of plate tectonics and the movement and collisions of crustal plates. The eastern section of the ring is the result of the Nazca Plate and the Cocos Plate being subducted beneath the westward moving South American Plate. The result is one of the Earth's highest mountain ranges and one of the most important volcanic activities. The population of volcanoes in South America is around 204 and the number of undated "Holocene" volcanoes (112) is also very important. Nevado del Ruiz is the northernmost volcano of the Andean Volcanic Belt, lying about 129 kilometers west of Bogotá in the Tolima Department of Colombia. The volcano is part of Los Nevados National Park, which also contains several other volcanoes. The Nevado del Ruiz is a stratovolcano, composed of many layers of lava alternating with hardened volcanic ash and other pyroclastic rocks, and its summit is covered by large glaciers. This volcano has been active for about two million years with three major eruptive periods. The current volcanic cone was formed during the "present" eruptive period, which began 150 thousand years ago. At 9:08 pm, on November 13, 1985, Nevado del Ruiz erupted, ejecting dacitic tephra more than 30 kilometres into the atmosphere. The eruption produced pyroclastic flows that melted summit glaciers and snow, generating four thick lahars (A lahar is a type of mudflow or landslide composed of pyroclastic material and water from glaciers that flow down from a volcano) that raced down river valleys on the volcano's flanks. They ran down the volcano's sides at an average speed of 60 km per hour, eroding soil, dislodging rock, and destroying vegetation. After descending thousands of meters down the side of the volcano, the lahars were directed into all of the six river valleys leading from the volcano. One of the lahars virtually erased the small town of Armero in Tolima Department. Of Armero's population of 28,700, over 23,000 were killed and approximately 5,000 were injured. More than 5,000 homes were destroyed. The second lahar, which descended through the valley of Chinchina River, killed about 1,800 people and destroyed about 400 homes in the town of Chinchina. The Armero tragedy was the second-deadliest volcanic disaster in the 20th century. Geologists and other experts had warned authorities and media outlets about the danger over the weeks and days leading up to the eruption. A number of different officials told the inhabitants that the city was safe and downplayed the possible effects, possibly due to the cynicism created by previous false evacuation orders. The volcano continues to pose a threat to the nearby towns and villages, and it is estimated that up to 500,000 people could be affected in case of eruption. Chaitén is a small volcanic caldera located on the flank of the Michinmahuida volcano in southern Chile. Before 2008, it consisted mainly of a rhyolitic lava dome last active 9,400 years ago. But in May 2008, Chaitén began erupting violently, producing numerous plumes, pyroclastic flows and lahars, and building a new lava dome on the north side of the old one. The eruption has had serious consequences for the nearby town of Chaitén, inundating it with lahars and ash. The 4,500 residents of the city were forced to evacuate the city. The navy was the one in charge of the evacuation because the village could only be reached by air or by boat. The ash plume of the eruption spread across Chile and Argentina to the Atlantic Ocean, contaminating water supplies and coating the town of Futaleufú (75 km South-East) with an ash layer 30 cm thick. 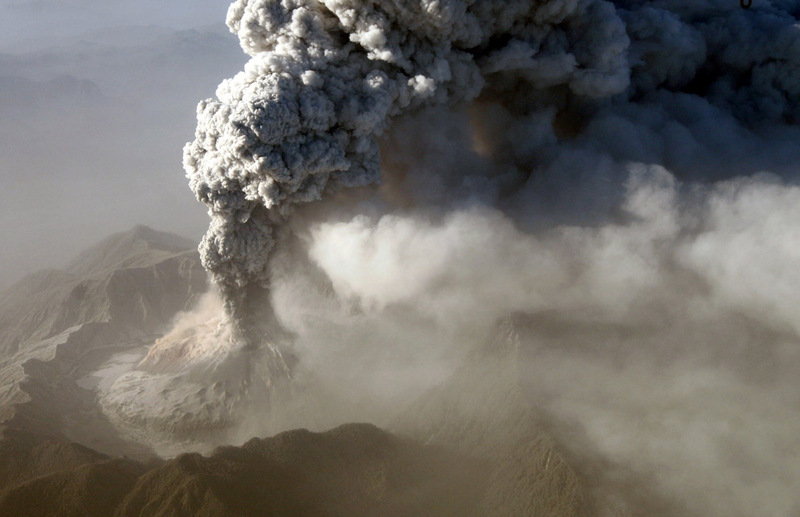 After the eruption of May 2008, volcanic activity was also recorded in the area of the volcano in February 2009. While the public perception is that volcanoes that have not erupted in historic times are dormant, volcanologists consider any volcanoes that erupted during the last 10,000 years (the Holocene Period) as potentially active. Around 100 volcanoes in the "Andean Arc" region of Chile, Peru, Ecuador and Columbia, some of which lie in densely populated areas, are considered active by volcanologists. A geologist from the University of Colorado explains: "There are 25 to 30 million people that live very close to at least one of these potentially active volcanoes in the Andean Arc, including the cities of Quito and Santiago. The eruptions of the Nevado del Ruiz and of the Chaiten volcano are good examples of what can happen at any time in the region”. Amongst all these active volcanoes, only a few dozen are actively monitored. of the simplified plate tectonics cross section shown on the right.